Stitch this easy friendship star quilt pattern using 12 inch star quilt blocks in different 3 layouts. So simple for beginners! But I think it's also a very retro looking star block. It reminds me of the shapes we saw in the 1960s, very geometric, outer space looking. Think the TV show The Jetsons. In this pattern the friendship star block alternates with plain square blocks to avoid matching seams. 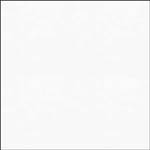 In addition to your usual quilting supplies here are your fabric requirements, based on 42 inches usable fabric and rounded to the nearest 1/4 yard. 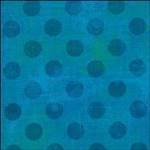 Use the color I chose - blue - or a fabric in your favorite color fabric and a neutral background color. 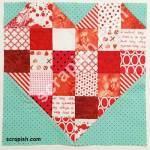 Make the blocks scrappy by using multiple shades and/or low volume prints of both colors. *Assumes that you will piece border strips. 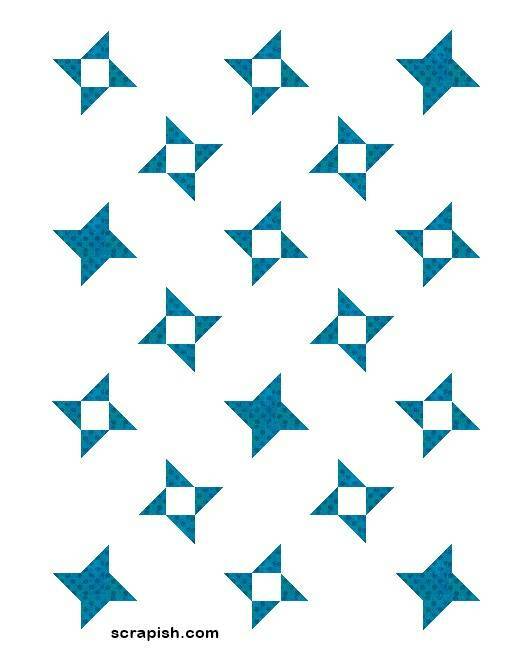 Review the lesson on how to make half square triangles or half square triangles 8 at a time. We will cut fabric as we go. Step 1 Cut Fabric for HSTs From Fabric A cut 5 (5 1/4 inch x WOF) strips; subcut 36 (5 1/4 inch) small squares. Step 2 Make HSTs Using the 5 1/4 inch small squares make 72 half square triangles (HSTs). (2a) Use a pencil to draw a diagonal line from corner to corner on the wrong side of the 36 (5 1/4 inch) Fabric B squares. (2b) Place one Fabric A 5 1/4 square right side up and place one Fabric B 5 1/4 square right side down on top of it. (2c) Stitch a 1/4 inch seam away from both sides of the marked line. (2d) Use a rotary cutter to cut the squares apart on the marked diagonal line. (2e) Press seam toward Fabric A. (2f) Trim HSTs to 4 1/2 inches. 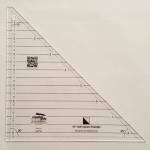 (2g) Repeat Steps 2a to 2f to make a total of 72 half square triangles (HSTs). Step 3 Cut Small Squares From Fabric B (white background) cut 11 (4 1/2 inch x WOF) strips; subcut 85 (4 1/2 inch) small squares. 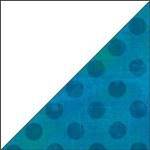 From Fabric A (blue print) cut 1 (4 1/2 inch x WOF) strip; subcut 5 (4 1/2 inch) small squares. Step 4 Make 18 (12 inch finished) blocks for this friendship star quilt pattern. Step 4a Make Block A Make 7 of Block A, laying out the patches as noted in the photo above. Each block uses 5 small squares and 4 half square triangles. 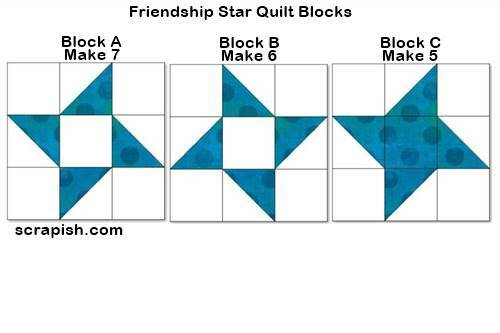 To make the friendship star quilt blocks, stitch the units of each row together. Then, stitch the rows together. Step 4b Make Block B Make 6 of Block B, laying out the patches as noted in the photo above. Note the direction in which the half square triangles point. They point in the same direction as Block A.
Stitch the units of each row together. Then, stitch the rows together. Step 4c Make Block C Make 5 of Block C, laying out the patches as noted in the photo above. Note the direction in which the half square triangles point. They point in a different direction from Block A. Trim the blocks to size. 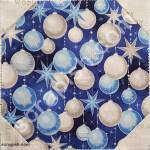 For this friendship star quilt pattern, trim blocks to 12 1/2 inches square. If your blocks are short of being 12 1/2 inches square, simply trim them all a little smaller but to the same size. Step 6 Make Block D From Fabric B (white background) cut 6 (12 1/2 inch x WOF) strips; subcut 17 (12 1/2 inch) large squares (or subcut them to the trimmed size of your friendship star quilt blocks from Step 5). Refer to the friendship star quilt pattern quilt assembly diagram for the steps below. 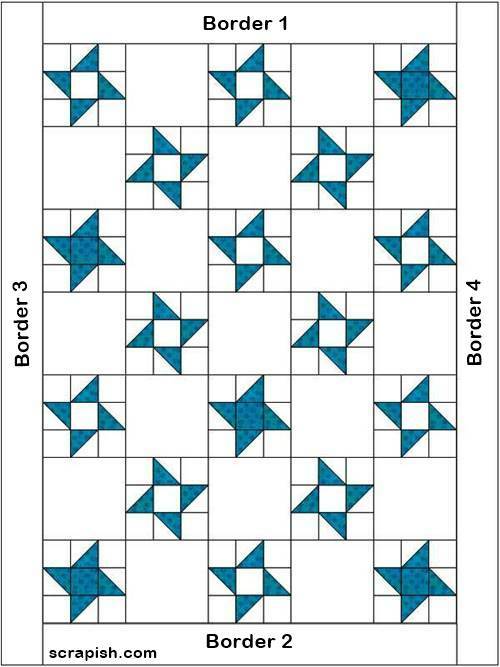 Step 7 Arrange Blocks Layout the 12 1/2 inch friendship star blocks and large 12 1/2 inch plain squares as shown in quilt assembly diagram, or as you desire. Step 8 Sew Blocks Together Stitch the blocks of each row together. Press seams of Row 1 to the right and press the seams of each successive row in the opposite direction of the previous row. Step 10 Press the seam between rows upward toward Row 1. For the border strips, the exact measurements for the pattern are given. But to account for variations that can occur in cutting and stitching you may want to piece each strip about 2 inches longer than specified and trim to size after attaching it to the main quilt body. Step 11 Cut Fabric for Borders From Fabric B (background) cut 8 (6 1/2 inch x WOF) strips. Remove the selveges from the ends, leaving as much usable fabric (at least 42 inches) as possible. 11a Border 1: Stitch 2 of the strips together along their short ends. Sew it to the main quilt body as shown in the Quilt Assembly Diagram above. Trim ends equal with main quilt body (approximately 6 1/2 x 60 1/12 inches). You should have about a 23 inch piece leftover. 11b Border 2: Stitch together the leftover piece from Step 11a and 1 (6 1/2 x WOF) strip along their short ends. Sew it to the main quilt body as shown in the Quilt Assembly Diagram above. Trim ends equal with main quilt body. 11c Border 3: Five (6 1/2 inch x WOF) Fabric B (background) strips remain. Stitch 3 of the strips together along their short ends. Sew it to the main quilt body as shown in the Quilt Assembly Diagram above. Trim ends equal with main quilt body (approximately 6 1/2 x 96 1/12 inches). You should have about a 29 inch piece leftover. 11d Border 4: Stitch together the leftover piece from Step 11c and the remaining 2 (6 1/2 x WOF) strips along their short ends. Sew it to the main quilt body as shown in the Quilt Assembly Diagram above. Trim ends equal with main quilt body. 11e Press seams toward border strips. Your beautiful quilt top is finished! Yay!!! Step 12 Layer the friendship star quilt pattern quilt sandwich in this order: backing, batting and quilt top. Step 13 Now quilt the three layers using the quilting design of your choice. Step 14 From the 3/4 yard of fabric cut 10 (2 1/2 x WOF) strips, remove selvages and join along their short ends to make a single long binding strip. To which friend will you gift the quilt you make from this easy friendship star quilt pattern?! Whoever they are they will love it!! !